Brownstein Hyatt Farber Schreck celebrates its 50th anniversary this year. In that time, we’ve grown from three friends who decided to start a law firm to a firm of more than 500 talented professionals in 11 offices across the country. Norm Brownstein, Jack Hyatt and Steve Farber had no idea what the future held when they opened their law firm in 1968—neither did Frank Schreck, who also started his practice the same year and later merged with Brownstein Hyatt & Farber in 2007. Over the past 50 years, Brownstein has seen a complete evolution of the legal industry as well as periods of economic recession and incredible growth, including expansion into Washington, D.C., New Mexico, Nevada, California and New Jersey. The one thing we know will remain true is that our success is contingent on the dedication of our employees, families, community members and friends and our partnership with clients. Thank you to all of you who have contributed to the firm’s success for the past five decades and for your continued support as we look ahead to the next 50 years. 1968 Firm Founded After graduating from the University of Colorado’s law school, childhood friends Norm Brownstein, Steve Farber and Jack Hyatt open the doors of Brownstein Hyatt & Farber. From day one, the founders utilized their legal acumen, networking and community-building skills to grow their firm. 1971 California Water Law Stanley Hatch, one of the founding members of Hatch & Parent, takes on the South Coast of Santa Barbara County representing the Santa Ynez Valley in the struggle over apportionment of the county’s water. 1971 Nevada Gaming Commission Frank Schreck joins the Nevada Gaming Commission at age 27. 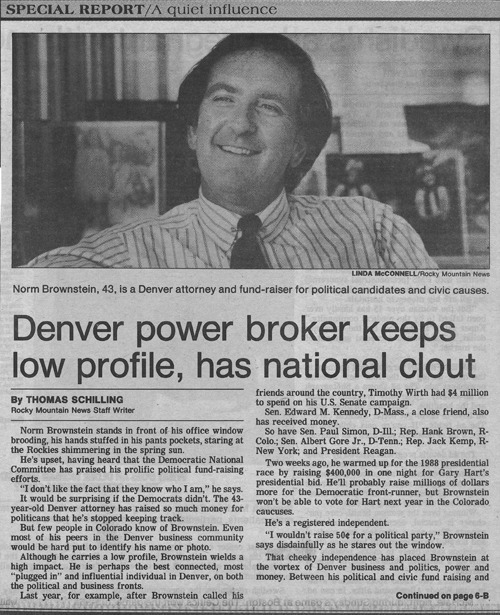 1977 Reputation for Real Estate Law Trammell Crow Company becomes a client. Now, 41 years and 800 matters later, it is still one of the firm’s most significant real estate clients. 1988 Firm Name Change The firm’s name changes to Brownstein Hyatt Farber & Madden. 1991 Jack Hyatt Retires Named partner Jack Hyatt retires to spend more time with his family after serving as the firm’s managing partner for 23 years. 1992 Central Platte Valley The firm begins assisting Trillium Corp. for many years with its acquisition and sale of 50 acres of land between Union Station and the Platte River. 1992 Firm Name Change The firm’s name changes to Brownstein Hyatt Farber & Strickland. In 1998, Tom Strickland is appointed U.S. Attorney by President Bill Clinton and the firm’s name returns to Brownstein Hyatt & Farber. 1994 DIA and United Airlines Our work helps shape the development of the new Denver International Airport, including working to secure $500 million in funding for construction and negotiating United Airlines’ lease at the new airport. 1995 DC Office Opens Building off Norm Brownstein and the firm’s advocacy efforts around the U.S.-Israel relationship, the firm opens an office in Washington, D.C., starting out with a cramped office space, a few employees and one client. 1996 Telecom Act of 1996 The firm helps the cable industry win a major victory in the Telecommunications Act of 1996, which paves the way for innovations such as broadband. 1997 Pepsi Center and Nuggets Our attorneys lead ASCENT Entertainment Group, former owner of the Denver Nuggets NBA franchise and the Colorado Avalanche NHL franchise, in negotiations with the city of Denver to finance and build the Pepsi Center—completing the first non-recourse financing of a sports franchise. 1998 Mile High Stadium The firm plays a critical role in the development of a new stadium for the Denver Broncos, including modifying legislation and negotiating agreements with the city to get the Broncos out of a long-term lease at Mile High Stadium. 2002 Mark F. Leonard Scholarship The firm establishes the Mark F. Leonard Scholarship Program, a four-year scholarship awarded to a staff member’s child each year. January 2003 Albuquerque Office Opens Our Albuquerque office opens with four attorneys to serve the needs of clients doing work in New Mexico. June 2003 Bruce James Named Managing Partner The firm names Bruce James as managing partner. Previously, Jack Hyatt served as managing partner until 1991, and from 1991-2003, the firm had a committee-based management structure. 2005 American Transplant Foundation Steve Farber founds the American Transplant Foundation following a kidney transplant from his son. 2006 TREX and E-470 Corridor The firm serves as counsel to developers of the E-470 Public Highway and the T-REX Project, Denver’s primary highway-light-rail corridor. 2006 Karma Volunteer Program After decades of giving back to the community, the firm formalizes its community relations program with the creation of the Karma Program and Committee. 2007 Merger with Schreck Brignone Merger with the Las Vegas-based law firm of Schreck Brignone to become Brownstein Hyatt Farber Schreck. Led by Frank Schreck, the firm brings a notable list of high-profile gaming clients with it. 2007 Pinnacle Building The firm is involved in the building of The Pinnacle at City Park South, a winner of NAIOP’s Development of the Year, and another example of the role of the firm in the revitalization and urban renewal of Denver. January 2008 Merger with Hatch & Parent Merger with California law firm Hatch & Parent creating one of the largest water practices in the country and adds five offices in California. July 2008 DNC Steve Farber serves as co-chair and a member of the executive committee responsible for bringing the 2008 Democratic National Convention to Denver. December 2008 Firm Doubles in Size The firm experiences unprecedented growth, doubling in size in four years due to the addition of new talent and the mergers with Schreck Brignone and Hatch & Parent. June 2009 AMLaw Top 200 and Top 10 Lobbying Firm American Lawyer names the firm to the list of top 200 highest-grossing law firms in the U.S., and the firm is included for the first time in the list of top 10 lobbying firms based on federal lobbying revenue. 2009 The Streets at SouthGlenn Alberta Development Partners turns to the firm for comprehensive legal representation and strategic counsel as they moved to redevelop, and revitalize, the once bustling Southglenn Mall. October 2012 Atlantic City Office Opens The firm opens Atlantic City office, giving the firm an East Coast hub to complement its Las Vegas gaming practice. 2012 Union Station The Union Station redevelopment project is the nexus of public/private partnerships, real estate and hospitality law. Brownstein serves as legal counsel to the Union Station Alliance, the development and investment group responsible for the station’s redevelopment. 2012 Pro Bono The firm formalizes its Pro Bono Program and establishes a Pro Bono Partner to lead the program. The firm averages more than 12,000 pro bono hours each year. June 2013 Adam Agron and Ellen Schulhofer Named Co-Managing Partners Adam Agron and Ellen Schulhofer are named co-managing partners of the firm after Bruce James steps down to return to his full-time real estate practice. September 2013 Expansion of IP Practice Brownstein invests in building its Intellectual Property Group with the addition of more than 15 professionals throughout the year given the important role intellectual property law plays in the U.S. economy now and in the future. 2015 No. 2 Lobbying Firm After being among the top 10 lobbying firms for the past six years, Brownstein reaches No. 2 on the list of federal lobbying shops based on revenue. 2015 Merger with Watson Rounds Merger expands the capabilities of the firm’s Intellectual Property practice, making it one of the largest IP departments based in the Mountain West. 2017 The Tax Cuts and Jobs Act The firm plays an important role in advocating for some of the most important changes to the U.S. tax code in 30 years. 2018 50th Anniversary Celebrating the first 50 years and those who contributed to the firm’s journey; looking ahead to the next 50 years of providing successful legal and legislative solutions for our clients. As the firm celebrates its 50th anniversary, we set out to create a video to look back at all the firm has accomplished over the years as well as what the future holds.